Finding live bait on New Year’s Day was easier than we thought. Pushaw’s Trading Post in Hope sold us twelve night crawlers and gave us directions to a man named Charlie who lived a few miles down the road and has been selling bait since he was four years old. He had three large tanks in his garage with live shiners separated by size: small, medium, and large. We paid four dollars for a dozen fish that were between two and three inches in length. I held the bucket in my lap as we drove back to Camden, watching the small fish swim around in their new home. After putting on warmer clothes and grabbing our fishing gear, we drove to the cove between Codman Island and the old fish hatchery on Megunticook Lake. Jessica’s brother, Tim, had a vintage spoon blade ice auger that kept us warm as we drilled five holes out by hand. At -5 degrees and with a strong wind blowing down the lake, our sweat quickly turned to ice as we set the first trap of the day on the first day of the year. 207 Paintings post everyish Tuesday around 5:30am EST on both The Maine and jessicaleeives.com. 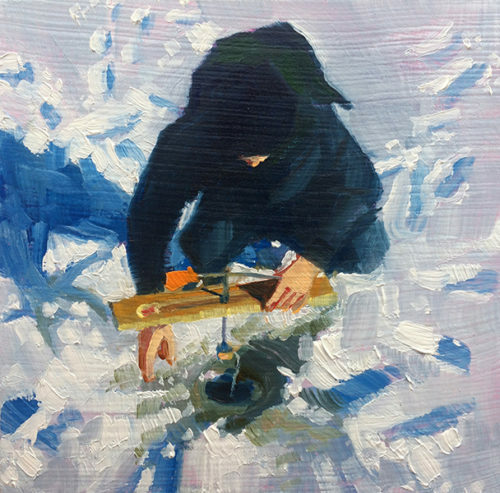 Save thirty percent on a 4×4 inch oil on panel painting by making your purchase within the first week of its posting. Instead of $300 pay just $207, a number which just happens to be the Maine state area code.